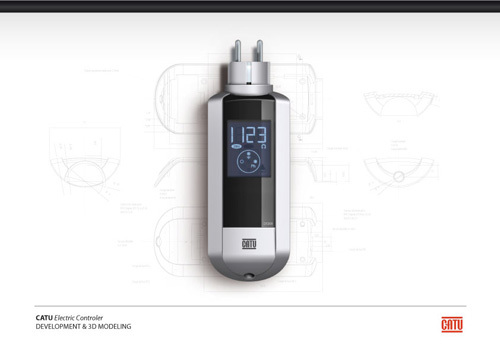 CAD 3D development / concept researches / design and ergonomical researches / expertising mechanica for the french agency of product and graphic design, Créatio. Développement et modélisation 3D / recherche de concepts / design et recherches érgonomiques pour Créatio, agence de design produit et de design graphique située à Paris. Projects: FACOM, STANLEY, MrBRICOLAGE professionnal and personnal tools, EILEO Id card reader for car rentals, ABRIS PLUS adjustable car shelter, STAGO automated blood analysers, DECATHLON, FOUGANZA ski helmets, ski chooses, ski boots, DUNLOPILLO, STANDARDGUM bedding and accessories, PRAT PARIS design of a briefcase, TELECOM DESIGN routeur, ethernet hub, VIA MICHELIN gps navigator, DEVIALET high end hifi audio system, CATU professionnal tools for electrical measures, LEGRAND domestic and industrial electrical equipment, MARECHAL industrial electric connectors, SAGEM home cinema projector, SIKA 3D & realistic illustrations for construction materials. 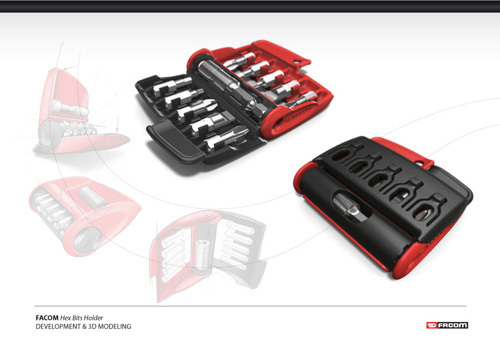 Design of a 10 piece bit set holder. Ultra compact / quick and easy to use / foolproof bit storage / pushing system to remove the hex bits. Ultra compact / résistance aux chocs / système de poussoirs pour sortir les embouts de la boîte. Design of a 9 or 12 piece combination wrench clip set. 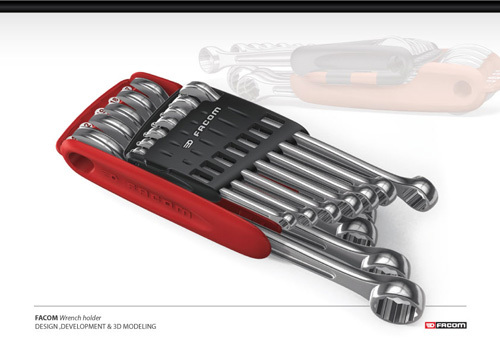 Compact / durable wrench locking system / clear wrench identification / quick, foolproof tool storage / belt hook. 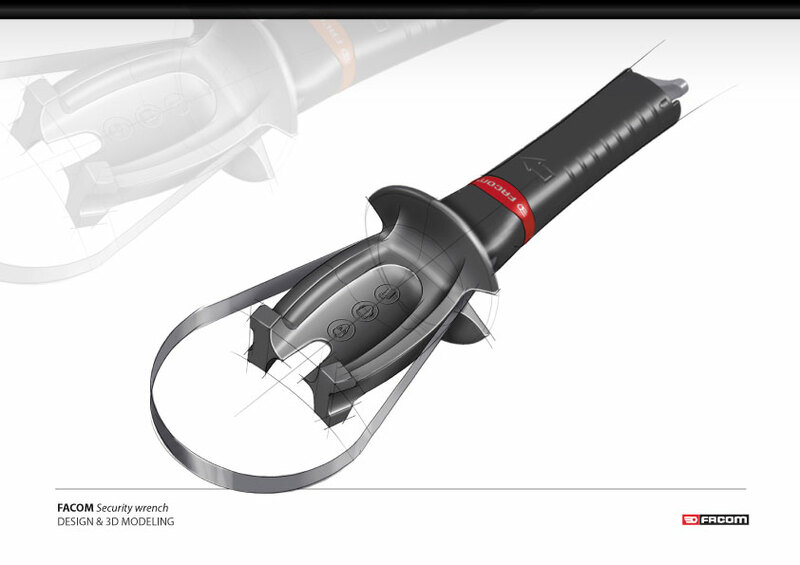 Design of an adjustable tool to hold wrenches that need to be shocked. 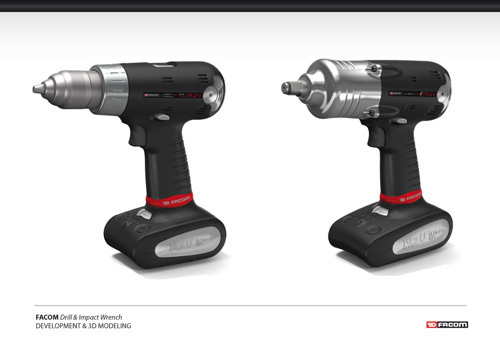 Design of the new R2 Nano socket, 48% more compact than R2A. Easy to arranged and carry in tools boxes / easy to handle / antislip material / metal hinge rod / plastic case resistant to workshop chemicals. Design of a new range of cordless electric drill / screwdriver and impact wrench. 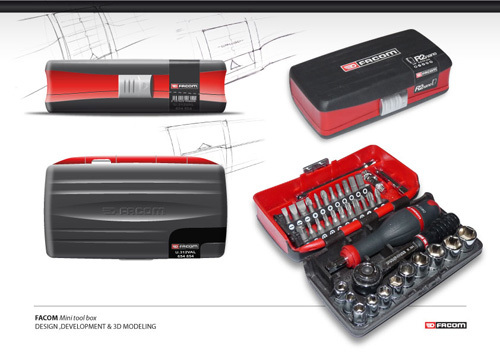 Powerful / lightweight / lithium - ion battery technology / easily interchangeable brushes / stronger / durable copper speed controller. 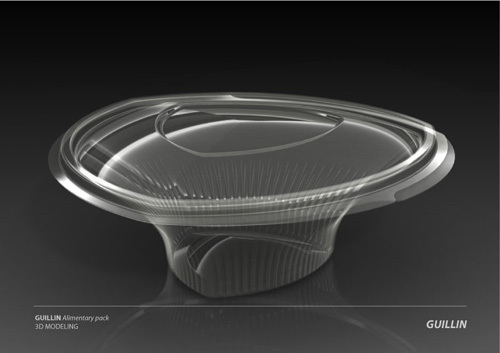 Design of a new pilable alimentary pack, made of ultra thin injected plastic. Lightweight / ultra thin material / resistant and economical. Design of a plexiglass stand for a high-tech audio amplifier. Simple / minimalist / and sober. Design of ski helment for Wed’ze, branch of french groupe of sport equipment Decathlon. 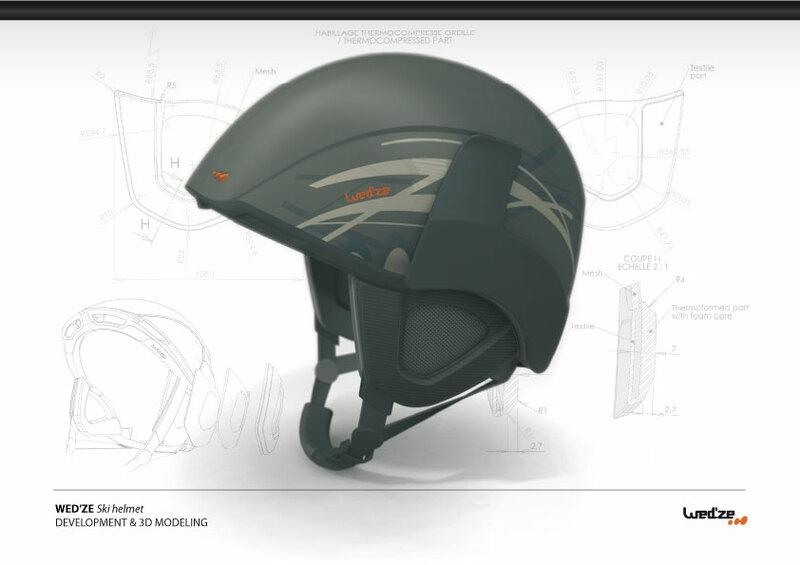 Multi season helmet with removable hear protections and locking system for google. 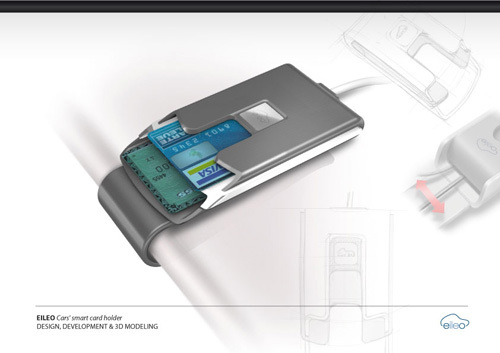 Design of a smart card reader / holder for car rentals. Design of a multi function electric controle with LCD screen. Fairings design for an automated medical analyser. 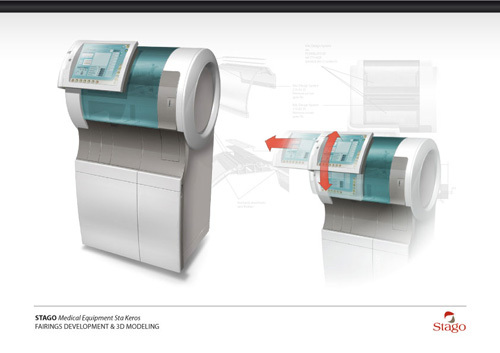 The tactile touch screen is articulated and can be adapted to user height. 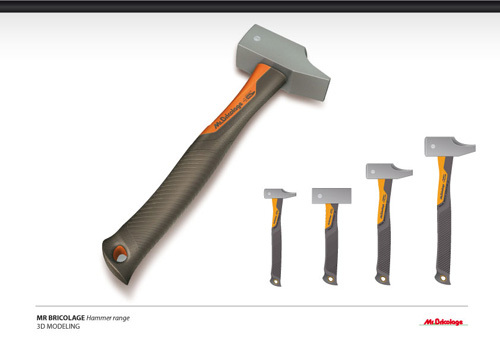 Design study of a hammer range for Mr Bricolage. 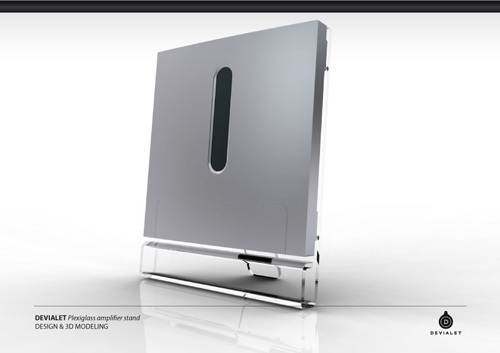 Sleek & modern design, with aluminum connecting pieces. 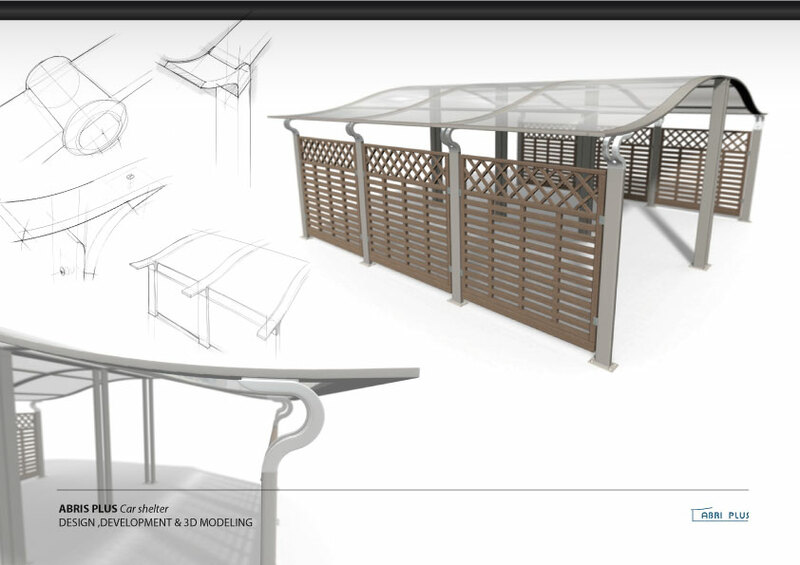 The polycarbonate roof lets in full light in the daytime while still providing shelter in bad weather.